Photo courtesy Brandy McDaniel and Jacob Valdez. Close-up of Morel mushroom cluster. Note the yellow color indicating they are ripe. Close-up of individual mushroom. Note how ridges circle back to form entirely enclosed spaces. Morel mushroom cut in half to show completely hollow interior. In the spring just as dewberries flower Morel mushrooms appear. Gray to almost black at first, in just a few days they quickly grow and indicate their readiness for picking by turning a yellowish color. Looking like a conical honeycomb on top of a thick stem, Morel mushrooms prefer growing in areas which had burned the previous year. 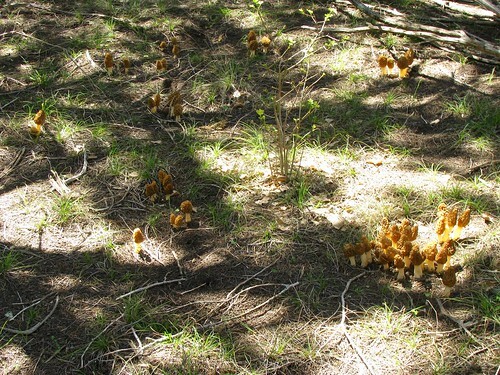 The highly caustic (bleach-like) sodium and calcium hydroxide leached from the wildfire's ashes seem to trigger Morels' growth after a long winter's nap. 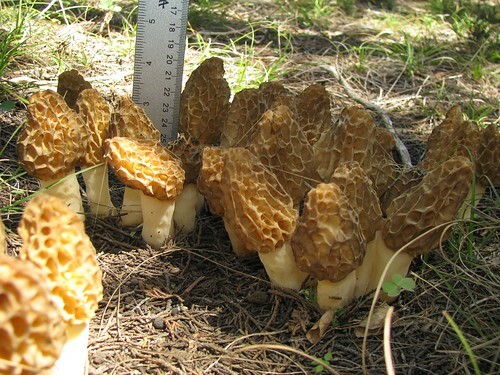 Here in Texas Morels are easily found around Dallas and farther north but traveling south they haven't been reported between Waco and the Gulf of Mexico. In the Texas Hill Country look on the ground under juniper/cedar trees. Morels generally require at least six weeks of freezing temperatures to grow but they have adapted to our shorter winters. Growing up, dad would sautée Morels in a butter or bacon grease with garlic and I find that hard to beat. They can also be grilled or roasted but due to their thin walls cooking them over fire can be tricky. Make sure you have plenty of these mushrooms to practice on open-fire techniques otherwise you'll kick yourself if even one burns up. 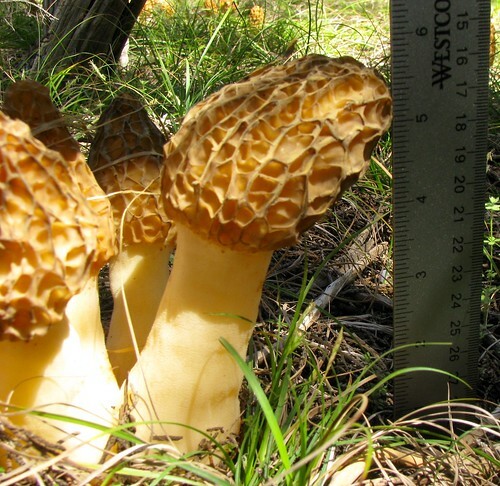 Due to the high desirability of these mushrooms, "Morel rustling" is a common crime which results in tens of thousands of dollars in fines being handed out to people picking them illegally in state and city parks. The only public lands you can legally harvest Morels (and all other mushrooms, too) are National forests and grasslands. 1. 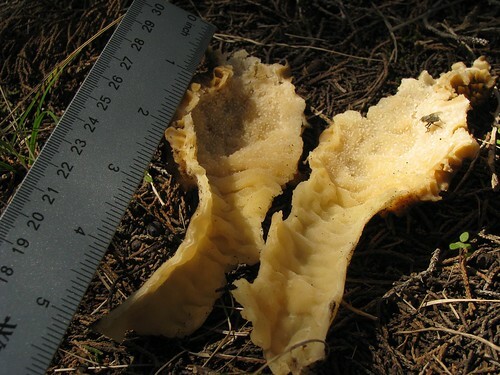 Only Morels will be completely hollow from base of stem to top of their conical head whereas false Morel mushrooms will have solid stems which pass through the caps and attach to the top inner surface of the hollow, cup-like cap. 2. The interior and exteriors of Morel stems have tiny bumps while false Morels will have cottony fillings. 3. 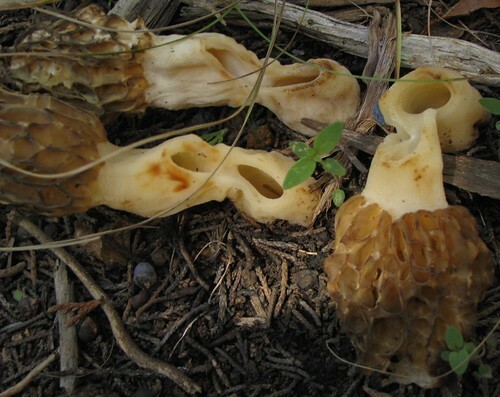 The indentations of true Morels take the form of pits and ridges forming complete enclosures whereas false Morels will have long, wavy ridges that don't circle back to make enclosed spaces.